Established alfalfa has good frost tolerance and will readily regrow once the weather warms. Harvest may be delayed by a week or two, depending on the severity of the frost. Alfalfa seedlings also have good frost tolerance after the third trifoliate leaf has developed. There is an intermediate period during the first and second trifoliate leaf stages when alfalfa seedlings are more sensitive to cold temperatures. Another Reason for Early Fall Planting. Planting early enough to allow time for development to the third trifoliate leaf stage before the first frost is important. This, as well as substantial yield and weed management advantages, is another strong argument for early fall plantings. Over many years, this practice (early fall planting) has stood the test of time for producing excellent stands. How about Roundup injury during frosts? Roundup injury to Roundup Ready alfalfa is an occasional problem in the Intermountain area where Roundup use prior to a frost has stunted the first hay cutting (see Orloff 2016). We have not yet seen this type of injury in the Central Valley, likely due to our warmer climate. However, pay attention to weather conditions at the time of application and work around frosts if possible, to avoid potential injury. What about those evil weevils? Weevils are definitely slow to develop with this cold weather, but they're out there right now, feeding on alfalfa plants. Do not rely on sweep net samples and current threshold levels (20 per sweep) if the hay is short and growth is delayed. Instead, pick stems, pull them apart, and look for weevils in the growing points. They're small and cryptic, so you might need a hand lens to see them. 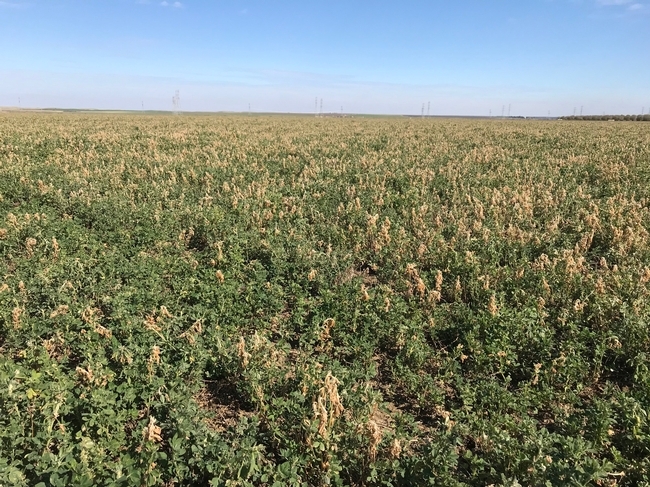 If the alfalfa growth is delayed and weevils are feeding in the terminal buds, then an insecticide spray is likely needed to protect the new growth. The risk of spraying too early is that a second spray might be needed if we have an extended weevil hatch. However, it's better to be conservative and protect growing points from damage from weevils when the plants are trying to regrow from a freeze. Alfalfa weevil larva feeding between alfalfa leaves.